(CHRIS) As usual, we did not get up when the watch alarm went off. It is so easy to ignore because it only goes for 20 seconds! It turned out today only not to matter because the banks opened at 9am. So we went thru the money-changing, gas-buying, grocery-shopping, post-card sending process in Maun and then headed north. We were told by a saavy local that we would need extra gas because there was no gas station until Kasane, near the Zimbabwe border. So we filled up our 30 liter water tank with gas also. This gave us a total of about 100 liters. Nice, paved Botswana roads deteriorated into bumpy dirt roads as we got closer to Moremi Reserve. 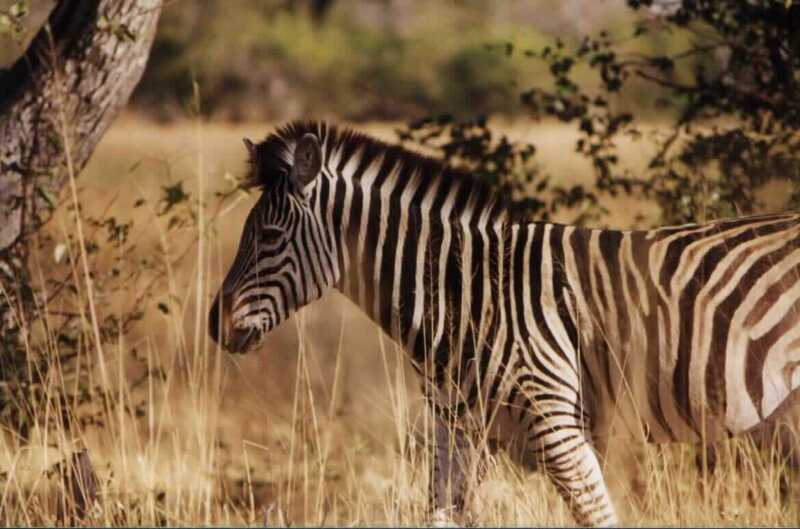 This National Park is the LAND area that juts into the Okavango Delta. The entrance fee was 160 pula for all of us – nearly 40 dollars – steepest yet! Also, they refused to give out camping permits unless you booked way in advance, even tho they were not full. So, we were given a day pass only. Nevertheless, we took the long route thru the park even tho we might not make it to the gate by curfew. It was awhile before we were actually driving near the delta so animals were scarce. Gradually, the numbers increased. Kudu and other antelope were common. We began to see many giraffe, zebras, and elephants too. We passed 2 unused log bridges (1st bridge and 2nd bridge.) Unused they were because the stream was dry. Then we got to 3rd bridge. We had to go over. It was made of wood logs 4 feet long and 3 or 4 inches in diameter. They were all tied together with similar logs running perpendicular. Didn’t look too sturdy, but it held our little Rocsta fine. It was bumpy but safe for all 4x4’s. It wasn’t too high off the water wither so no major danger was involved. We ate awesome pastrami and provolone sandwiches with hot sauce at 3rd bridge campsite. Great grocery-buying guys! We also replenished our water here. We moved on at a slower pace, realizing we would not get to the gate in time either way. We came to a halt at a pair of large, beautiful ponds. They had grassy banks and inviting blue water. We decided to swim and walked to the shore to investigate. The pond was packed with stealthy, sneaky, evil crocodiles. Some were light green with menacing black spots. Some were longer than 6 feet and all were scary. So we watched the crocs and waterfowl and impala as the sun began to set over this lovely pond. Swimming would have to be foregone. We drove back to 3rd bridge campsite, collecting firewood on the way. Of course, there was plenty of space at the site. We set up on some lovely grass in the shade of a huge tree. We had a downed barkless tree also for a bench and a cozy Sam-made fire to keep us toasty. We ate PB&J and used the sweetwater to pump some drinking water. We wrote in the Log and told stories of old as we listened to the horrible animal noises coming from the jungle. The all-new Southern Hemisphere stars were brilliant in these hours before the red moon rose.